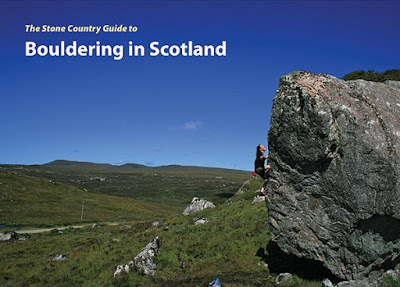 Those of you locals maybe a little disappointed at the problem-count of your favourite venues in 'Bouldering in Scotland', do not fear! I have added some additional page downloads to the main site on the Scottish page. Venues include: Craigmaddie full topo, Shelterstone circuit, Scatwell, Ben A'an and The Whangie. 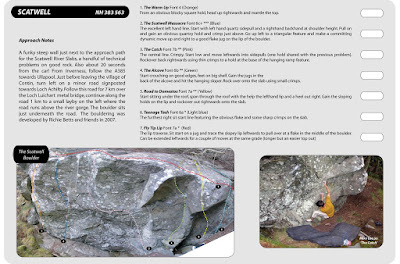 Development continues apace, indeed, Tom Kirkpatrick has just updated the Cammachmore topo on Scottish Climbs, and Dave MacLeod has added a new V10 to the Pine boulders in Glen Nevis (The Bear Trap Prow, pics on his blog) - he also did a very kind and exhaustive review for the new guide, thanks Dave! One of my problems as an independent publisher has been sourcing good photos for books and this is difficult on a limited budget as, quite fairly, photographers need paid just like the rest of us. This becomes a problem when you are doing a large edited collection and paying twenty photographers would quickly make a book too expensive, so we tend to rely on favours and generosity, trying to pay back in kind what has been submitted (usually free books and a little advertising in return). 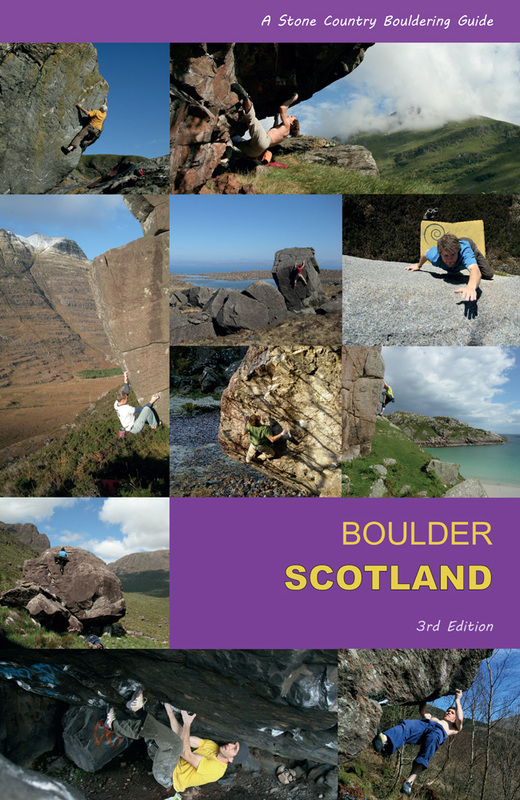 I know there are plenty of good photographers out there and I did ask a lot of folk to contribute to 'Bouldering in Scotland', unfortunately maybe my poverty and inability to pay much is the curse of the small publisher, so I hope people can forgive some of the images from my own camera... I am no great photographer but needed images to help illustrate the variety of bouldering in Scotland. Anyway, thanks to all who helped contribute to the book... it really wouldn't have existed without such generosity of spirit and profits from the book you can rest assured are being pumped straight back into serving the climbing community with quality publications to inspire them - that's our remit at all times. It's an expensive game just printing a book, but in future I hope to be able to commission more photography for Scottish books. Indeed the next big project is a Scottish trad book on big climbs in Scotland, with hopefully some great images from Scottish photographers who sacrifice so much time and effort and money to get into great positions and great landscapes. 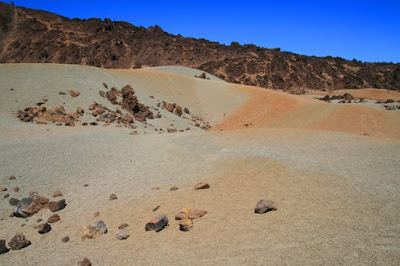 For example, check out Dave Cuthbertson's landscape images here. Just to remind all that the 'Bouldering in Scotland' and 'Elements' bouldering movie will be launched this Thursday evening at Cotswolds Outdoors, Crow Road, Glasgow, at 7pm. 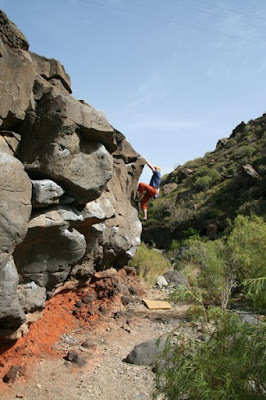 There will be a short talk and slideshow of new bouldering areas, as well as a twenty minute preview of the movie. Free wine and discounted stock at Cotswolds (book and DVD will be heavily discounted). Easy access and parking at Cotswolds, just besides Sainsbury's in Partick (Crow Road), or catch a tube to Partick and it's a two minute walk round the corner. There will be free wine and no doubt lots of banter about all the new bouldering areas... all questions will be answered. 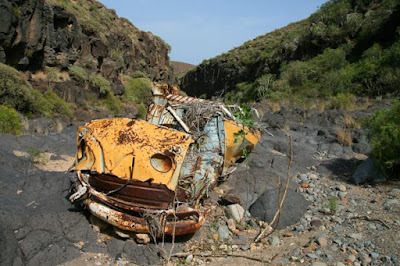 New venues include: Lost Valley, Craigmaddie, Coilessan, Ardnamurchan, Ardgour, Brin Rock etc. Everyone welcome! They're nearly here! 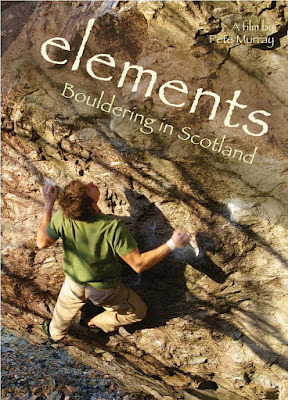 Both the new Bouldering in Scotland guide and the bouldering film 'Elements' will be available a little later in March. As a special prepub offer, the book and DVD are available for £30 plus p&p... that's a good offer folks, so if you want to buy both, you can do so securely through the Paypal buttons on the blog or on the film page on www.stonecountry.co.uk where you can also view a trailer of the movie. Pete Murray spent six months putting this film together, enduring some very elemental days with the camera, oblivious to crashing waves, snow, brass-monkey frosts, melting microphones, howling gales and endlessly failing boulderers (well, some of us!). “elements” is a rock climbing film like no other, the four chapters – Water, Earth, Air and Fire – are linked with a narrative from the ecologist and land rights activist, Alistair McIntosh, whose thoughts on faerie magic and the human spirit fix a connection between Scotland’s ancient history and the boulderer’s search for perfect movement on rock. 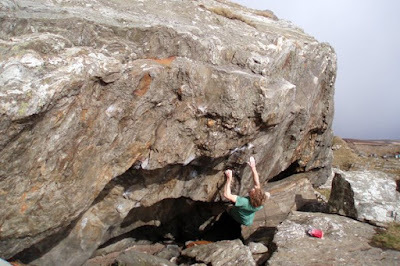 It's the first DVD devoted entirely to bouldering in Scotland. 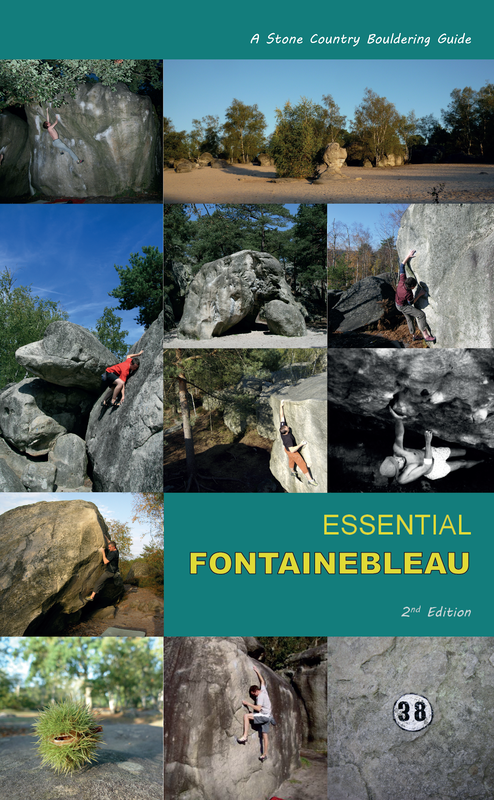 Filmed over six months in late 2007 and early 2008, it features dozens of ascents in new venues from all four corners of the country – including the first ascent of the hardest new boulder problem so far this year, captured on the final day’s filming! 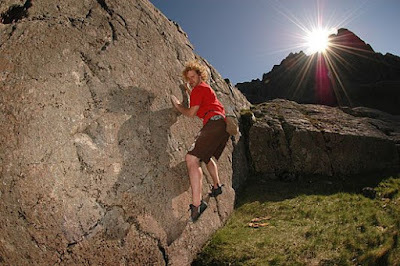 With music by new Glasgow band, Frightened Rabbit, “elements” is released in Spring 2008, to coincide with the publication of “The Stone Country Guide to Bouldering in Scotland". There will be a launch at Cotswolds on Thursday 27th march at 7pm, free entry to view the film and a lot of free wine! Luke Fairweather has climbed a new variation to Tim Rankin's Kayla, working a different finish to give a new 8a called Twlight Princess. the pit left making the last desperate move to the lip (british 7a move). 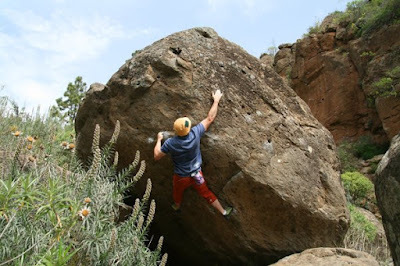 The problem is 'dam awesome' and has taken 6 visits and may be 8a+, the hardest in the North East so far? 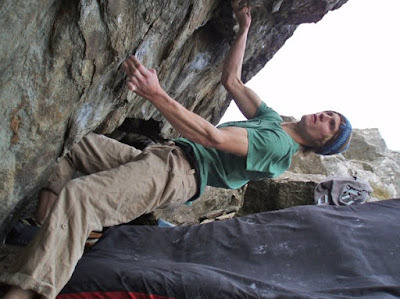 He also repeated Tim Rankin's 'Shameless' which he confirmed at a heady Font 7c+. Pic below.